I've debated whether or not to write this post for a few days now. I wasn't sure it was worth it. I wasn't sure if it would be better to try and forget and just move on. But after days of feeling angry and sad and scared, and festering and stewing over this, I decided that writing about how I'm feeling might be best. John and I live in that wonderful city that just hosted the Super Bowl - Indy! We were so proud and impressed with all the city did to host this major event, and we were lucky to be so close to all the action. We took advantage and visited Super Bowl Village several times, and really took in all the excitement. 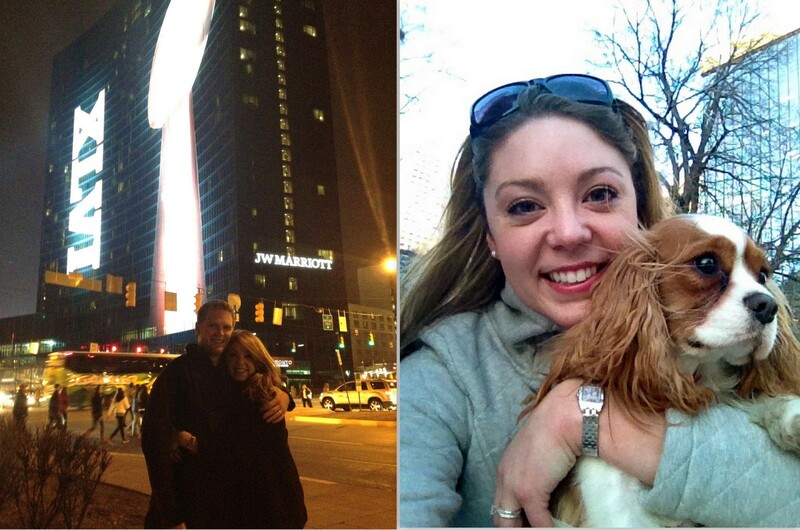 Outside the JW Marriott and with Hoosh after walking to Super Bowl village! Then Saturday happened. John was less than three blocks from our apartment when a man blindsided him from behind, knocking him to the ground. He proceeded to kick John in the ribs, before saying, "Give me your cash or you're dead." John gave him his cash, and the criminal ran away. It was only then that one of the 15 people around him bothered to walk up to him and say, "You alright, man?" When John told me what happened I immediately got in the car to get him. I will not soon forget - if I ever do - how he looked as he walked; my tall (6'3), fit husband was hunched over with a huge lump on the side of his face. He struggled to get in the car, and I immediately lost it. Hysteria. Complete hysteria. There is no other way to describe my reaction. I'm not much of a crier, but this sent me to a place I didn't know I could go. John was the one mugged and violated, yet I was inconsolable. I barely managed to get words out when I called his mom to tell her what happened. John, as always, was the calm and collected one. Somehow through the violent sobbing I managed to help him, though I feel like I was a zombie. Hours later my body must have given up on me, as I suddenly fell into a deep sleep. I awoke to John's bruised ribs and face, and his weak smile. Yet again, he was telling me that it was okay. But how could that be okay? He managed to give me a little smile...he's gotten blacker and bluer since then. As friends and family learned of what happened I continued to get messages and calls filled with the same words, "But how could someone do this to John of all people? He's the nicest person in the world!" He truly is. There is not a kinder or more genuine person. Not only that, John would have been the first person to help if he watched that happen to another person. In the wake of what happened I'm left with some troubling thoughts. What if it had been worse? How could no one have said or done anything? Is it even safe to stay here anymore? These questions have made my chest tight, tears prick my eyes, and fear linger in my heart. But in spite of those feelings, I've been left... grateful. Grateful for my husband, for his forgiving heart - even when I am not ready, his strength, his graciousness, his safety, and for him, period. But most of all, I am grateful to God. For His protection of John, His grace, and His strength, which I know is the only thing that will allow me to forgive and move on. So with that, I thank you for reading this long post, if you stuck around to do so. And hopefully, you are reminded to be thankful for those special in your life. on our honeymoon...had to end with a happy picture! oh Lauren this hit me so hard. i can't imagine how you felt when you got that phone call and saw him. i'm so glad everything is ok. definitely reminds you to be grateful! Thanks, Jourdan. Yes it does! I'm trying to focus on the positive. That's what matters. I actually wrote a blog recently detailing my concern that NO ONE stops when they see someone getting hurt. No one even stops to call the police... they just walk on. It's so disturbing. And it's especially hurtful when it happens to someone you love. I just don't understand, if you see a crime happening, say something, do something. Don't just walk on. That is so true. It's something I didn't really think about until this happened. I would love if you commented with the link to your post, and I will update this post to include it. Thanks so much for sharing your thoughts! I am very sorry to hear that this happened to John and you. I've been through a couple muggings in chacago, they are never fun. But as far as people not speaking up or helping, unfortunately our generation was always taught to cooperate and give them what they want. Which is why this still happens, criminals know that most people won't do anything. Also most muggers are really just making a move of desperation at that point so if you can't identify a weapon don't do what they say, unless you have no idea how to defend yourself. In johns case I would say he did the right thing, being blindsided is never fun and doesnt give you a lot of options for self defense. Anyways, before I really start to rant, I'm glad neither of you are Permanently hurt. Just remember to be aware of your surroundings and you will be just fine. Thanks so much, Jason. I am so sorry to hear that you have been through not only been through one mugging, but more than one. You make good points about our generation. It is so sad. I don't wish this upon anyone, and I can only hope others will think twice. You give good advice though; we should always be aware of our surroundings - even if others are near us. You can never assume or be too careful. I'm so sorry to hear this happened! That's incredibly scary. It terrifies me to think of that, or worse, happening to Mike. ::shudder:: I'm glad he is on the mend, and soon it will be no more than a memory. I hope you are able to feel safe in your town again. Thank you, Jessica. You are so sweet to reach out. I'm sure it will take some time to feel completely safe again, but with His grace that is just what I will do. As you probably saw, I have posted this on my facebook. I have read it over and over and each time I cry. I love you both so much and I thank you for loving my son the way that you do. God answered our prayers when he found you for John. I was the one who cried when I read what you wrote, Leslie. It means more to me than I can ever say, and I am so blessed to have joined such an amazing, amazing family. Thank you for your endless support and love. I love John more than words can say, and I am thankful beyond words for you and your family. Thanks, Trish. He really is all those things he appears to be. I never thought about it that way - that he complied to make it home to me. That is such a beautiful way of thinking of it. Thank you for your kind words and wisdom. And take care of that Airborne Ranger! :) Thanks for reading! That's so sad that no one helped him! What is the world coming to?! I am glad that nothing worse happened to him.